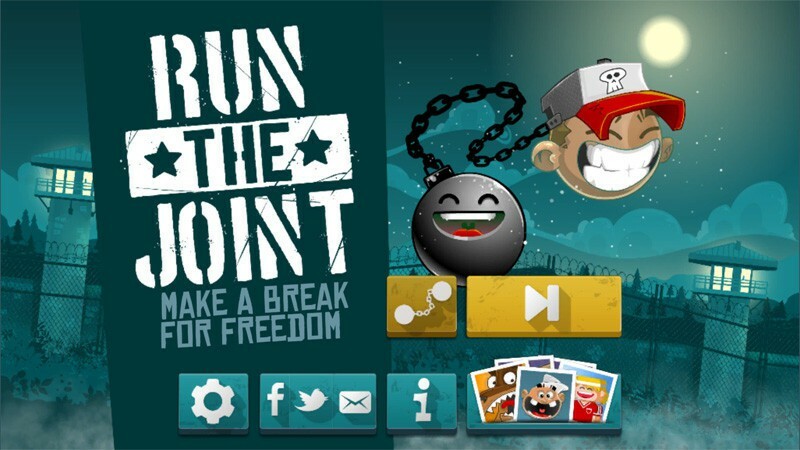 Run the Joint opens with a rather routine main menu that has options to access the game’s settings, visit the game’s social networks, view the About Screen, check out additional games by the developer, visit the gaming store and jump into gameplay. Settings cover the basics such as language choice, muting the sound and opting out of the ad-support (for a $0.99 fee). You begin playing Run the Joint as Highway Bob with additional characters available for purchase in the gaming store. There are six additional characters available, each costing $0.99 via in-app purchase. Gameplay involves ten venues or levels, each progressively unlocked. Your gaming controls with Run the Joint are simple in that you tap the left side of the screen to make your ball and chain jump. You tap the right side of the screen to make your character jump. Getting to the actual gameplay is a little on the odd side, with a launch screen where you will need to jump five times to get to the gaming screen, where you then tap the screen to begin play. Your character’s forward movement is automatic and all you need to do is concentrate on jumping over obstacles and across gaps in the platform. You will have tokens and collectables to gather as your race to freedom that can be used to continue gameplay should your character meet his fate. Gameplay is surprisingly challenging and relies not only on your skills at timing but also your coordination. Since you have independent controls for the inmate and his ball-and-chain, you don’t have to jump them at the same time. In fact, it often is the case where you have to jump one after the other to clear an obstacle. You can also run your character across on platform of the level and your ball across another. Should your character or ball miss a jump, get hit by a rocket, have a bloodhound catch them or run into any of the other dangers, the game is over. You can spend your tokens to continue play. Progress across each level of play is done by stages, with each stage being a little more challenging than the previous. Your character will speed up and the game will require your undivided attention to have any shot at success. Run the Joint is a fun Windows Phone game, but by no means a pushover of a game. Graphics and animations are nicely drawn up and gameplay is a strong test for your timing and coordination. You are essentially playing two games at once with your success directly connected between the two. Don’t be shocked to find that you are jumping both your character and ball at the same time just out of reflex instead of need. The game does rely on full-screen ad-support, which I’m not a fan of. However, I have to give the developer kudos for spacing out the occurrence of these irritating ads to minimize the frustration they can cause. For the most part Run the Joint ran smoothly, but there were some graphics glitches while playing from a Lumia 950. Nothing to rise to a deal-breaker level, but still noticeable. Overall, Run the Joint is a fun game to check out and try. It is a free title in the Windows Phone Store with ad-support and in-app purchase opportunities. ELEX Update 1.02 is now rolling out on PS4 and Xbox One.